Need advice about a specific Audi A4 problem? Chart based on 20 repairs. See TSBs and recalls for the 2017 Audi A4. Chart based on 14 repair trips. The repair cost chart excludes repairs made under warranty, do-it-yourself repairs, and repair trips that include maintenance. 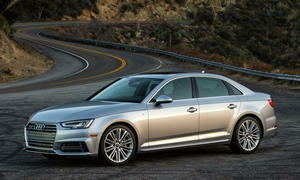 See repairs for all Audi A4 model years. 20000 mi Rear passenger window would not operate. Dealer replaced switch. Oct 2016 The drivers window stopped going up or down. 10000 mi Trip odometer spontaneously resetting (long-term). Instrument cluster changed. 14000 mi Backup camera periodically not engaging when backing up. Only engine restart fixes problem. 8000 mi Woofer on rear deck defective. Repaired under tech. service bulletin. Apr 2016 Coolant leak. Defective cap. 1000 mi License plate frame screws stripped by dealer - common Audi issue. Clicking noise from driver assistance system. Dealer says this is normal, but I don't believe so. The car is very quiet and this is a very strange clicking noise when the auto cruise control is working. I will have it checked again at the next service trip. 7000 mi Car was a buyback due to the MMI locking up and the driver assistance feature pulling the vehicle to the left. 8600 mi Rear passenger window seal/gasket was deformed. The cause of deformation was unknown. 24180 mi A warning message about safety restraint system not operational. Dealer said the seat pressure sensor operating correctly. Message still occurs infreqently , once a every few days. 2300 mi Rattle from passenger-side glove box. Dealer tightened trim retaining screws. 8000 mi Nav screen flickering. Dealer performed software update which lessened the flickering. It still occurs but is less frequent/noticeable. Rattle present on passenger side. Dealer could not isolate the cause but applied felt tape to known trouble spots proactively. Rattle much less frequently. See our lemon odds and nada odds page to see vehicles with no repairs or vehicles with more than three repairs. To see how frequently 2017 Audi A4 problems occur, check out our car reliability stats.